Feeding a few hens in the back garden to provide eggs should not be an expensive business. It is possible to have low cost hens. The equipment required, a plastic feeder and water dispenser can be bought for just a few pounds each. Of course you can pay more for galvanised feeders etc but it’s just not necessary with a small flock. Feeding hens ‘on the cheap’ is a bit trickier. In times gone by, the hens were almost left to fend for themselves especially in the summer. They’d pick up a variety of grains, seeds, greens and insects which were sufficient for their needs. Throw in a mash made from kitchen scraps and the odd handful of corn and that was all they needed. In those days the average hen would produce between 100 and 150 eggs a year and the commercial producers were chasing the target of 200 eggs a year per hen. Fast forward 60 years or so of the breeder’s art and 200 eggs a year is considered poor. Commercial egg producers are looking for at least 300 eggs per hen. To produce this number of eggs requires a better level of nutrition than a hen can pick up scratching around a yard. Whilst the breeders have increased the hen’s capacity to produce eggs, they’ve not managed to increase the hen’s capacity to eat. The modern hen’s crop is no larger than her ancestor’s crop. So, to provide the nutrients required to produce those 300 eggs and keep the hen healthy, it’s critical she’s fed with feed carefully balanced to provide the correct levels of required nutrients. Feeding treats is still possible but not too many or, like a child filling up on sweets your hens won’t have room for their meal and so won’t get the nutrition they require. Which Breed of Hen Costs Less? 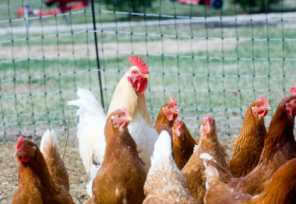 This feed problem does raise an interesting question – which breed of hen is going to be the lowest cost per egg produced? The high yielding hen fed mainly on commercial layers pellets or a lower producing traditional pure breed fed mainly on scratchings and perhaps kitchen waste made into a mash. NB – you should not feed meat or fish scraps or vegetable waste that has been in contact with them for fear of giving your hens e-coli or something. Amazing how the human race survived without DEFRA and Health & Safety. Practically, whatever breed you have, feeding layers pellets is the easiest way of ensuring your hens have a balanced diet. The question then becomes where to get them from. Probably the most expensive source will be a pet store. They seem to be really cashing in on the boom in keeping hens at home. Online suppliers can be good value for money, especially if you’re pressed for time and far from a farm shop. Farm supply shops do tend to be the cheapest way to buy chicken and other poultry feeds. 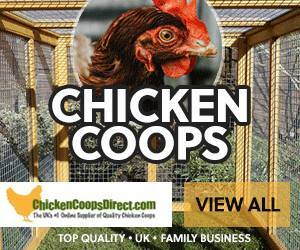 Try yellow pages or asking around other poultry keepers for your nearest. We've over 1,000 poultry breeders listed across the UK! Chickens, ducks, geese, turkeys, quail - even ostriches! How to be self-sufficient when travelling around the world? How to travel around Europe in your motorhome without resupplying?